A family run Meet and Greet parking Service offering Stansted parking with a personal chauffeur driver service. We started the company after realising the need for a cheaper hassle free way of storing your vehicle. Whilst you're away your car will be kept at our secure storage compound located approx. 8 miles from Stansted Terminal which is manned 24hrs a day, 7 days a week. The compound has 8ft security fencing, flood lighting and two reinforced entry gates. The Valet parking or Meet & Greet parking company offers a convenient alternative to park & ride parking at Stansted Airport - where you are met by a fully insured driver who will help you to make an easy and convenient transfer to the airport terminal. Customer responsible for paying the exit fee of up to £6. 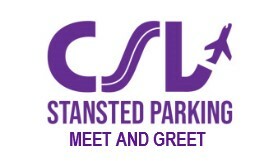 No transfers are needed, CSL Stansted Meet and Greet will be an excellent alternative for disabled customers who would find it difficult to use transfer buses. Your car is collected from the terminal when you leave, and brought back to you at the terminal on return. Please take your booking confirmation with you on the day of your parking. On the day of your arrival simply call us 20 minutes before you arrive to arrange a member of our team to meet you. (If you are travelling north on the M11 then you will need to call us when your at Harlow Junction 7. If you are travelling south on the M11 please call us when you are at Saffron Walden Junction 10). Our drivers will inform you to go to either zone C of the Express set down or the orange short stay car park, where a member of our team will be waiting to check and collect your vehicle..
Once your return flight has landed please call the CSL driver line once you have cleared passport control and collected all of your luggage to arrange the return of your vehicle. Then make your way to the 15 Minute Short Stay Car Park (located on the middle level of the terminal next to the bus station) where a member of our team will be waiting with your vehicle. On the day of your arrival simply call us 20 minutes before you arrive to arrange a member of our team to meet you. (If you are travelling north on the M11 then you will need to call us when your at Harlow Junction 7. If you are travelling south on the M11 please call us when you are at Saffron Walden Junction 10).